More info:From £599 - £630 excluding flights. Prices based on 2 adults sharing. Single supplement available. Mimimum age 14. In contrast to its neighbours, Laos is still relatively little-visited so the income we bring to this area really helps local development; particularly as we use locally owned services throughout the tour. This trip blends some of the country's stand-out highlights with travel through more rural areas and past rural communities. We visit Luang Prabang - a city so beautiful that it has been designated a UNESCO World Heritage Site, meaning our entrance fees contribute directly to the upkeep of this special destination. 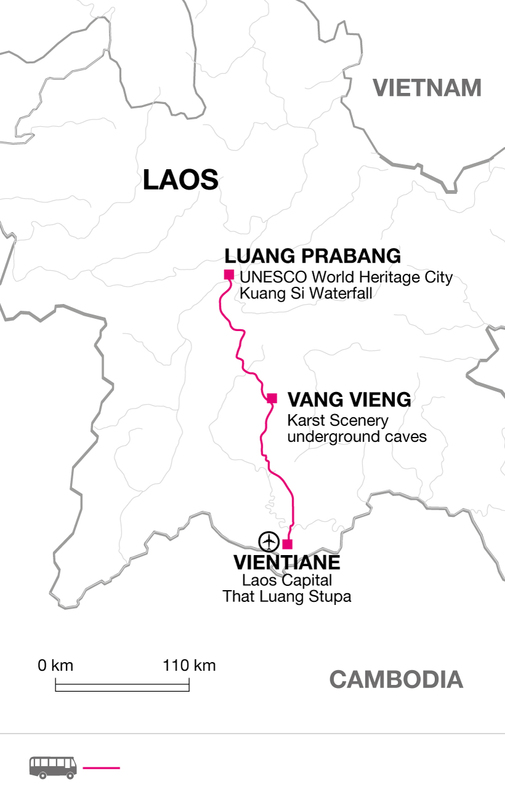 Laos's towns and cities are relatively small in scale and therefore are ideal places to explore on foot. On this trip we explore each destination on foot, allowing us to get closer to the action and reducing our impact on the environment. When coaches are being used to travel between destinations, we keep the size of the coach to a minimum, so rather than using gas guzzling 40-50 seaters we opt for more environmental friendly 15-25 seat coaches that use less fuel and therefore admit less carbon. Due to the continual aerial bombardment during the Vietnam War, Laos is the most-bombed country in the world. Many of the bombs dropped didn’t detonate, and unexploded ordinance (UXO) is a real danger to everyday life in parts of Laos. On this trip we visit the COPE museum in Vientiane whose excellent work includes increasing public awareness around UXOs and helping to provide prosthetic limbs to the many landmine victims. By visiting we will contribute directly to the fantastic work being done here, and we hope to be able to spread awareness of the blight of landmines in Laos. When amongst the rural communities, we’ve factored in time to get the chance to meet the local people, learn about their traditions and daily life and interact with them in a manner which is both insightful yet respectful. Your local tour leader will be a great facilitator in this regard. Buying crafts directly from them cuts out the middle man and enables them to supplement their income in an area where the economic opportunities are few.